The last edition of the Almanac contained an amusing error, practically reversing the meaning of a passage by swapping in "defy" where "deify" should have been. What a difference "I" can make! With the Woods' Walk still in memory, let''s give Bill Bryson's book another chance, full of good quotes as it is . . .
"There is no point in hurrying because you are not going anywhere. However far or long you plod, you are always in the same place: in the woods. It's where you were yesterday, where you will be tomorrow. The woods is one boundless singularity. Every bend in the path presents a prospect indistinguishable from every other, every glimpse into the trees the same tangled mass. For all you know, your route could describe a very large, pointless circle. In a way, it would hardly matter." Tuesday, March 13, 7:00 pm at the Vineyard Haven Library. 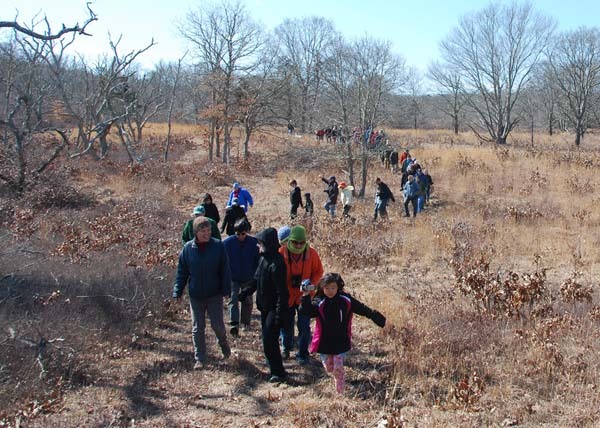 Join Tisbury officials for a panel discussion of how decisions are made regarding conservation priorities. For more info, call 508-696-4211. Wednesday, March 14, 3:00 pm, Edgartown. Samantha Whitcraft discusses the importance of sharks, shark myths, and ways to help protect sharks. Free. At the M.V. Museum, click here for directions. Wednesday, March 21, 5:30 pm at the Vineyard Haven Library. The Sustainable Book Club’s March selection is Eaarth, by environmental activist Bill McKibben. The book offers an in-depth, sobering, yet ultimately optimistic approach to dealing with the situation we're now facing. From Barbara Kingsolver -- "What I have to say about this book is very simple: Read it, please. Straight through to the end. Whatever else you were planning to do next, nothing could be more important." Copies of Eaarth are available at the library or through CLAMS. 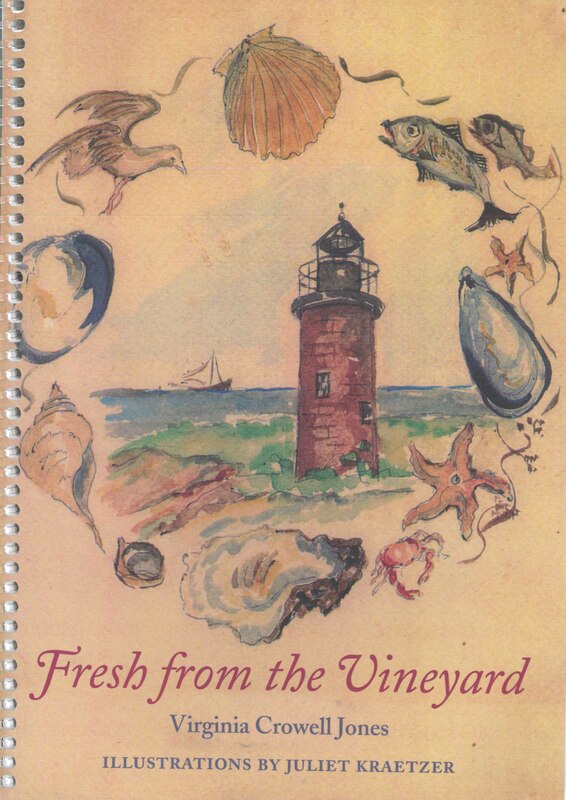 This week we share Virgina Jones' recipe for stuffed quahogs from her book, Fresh from the Vineyard. 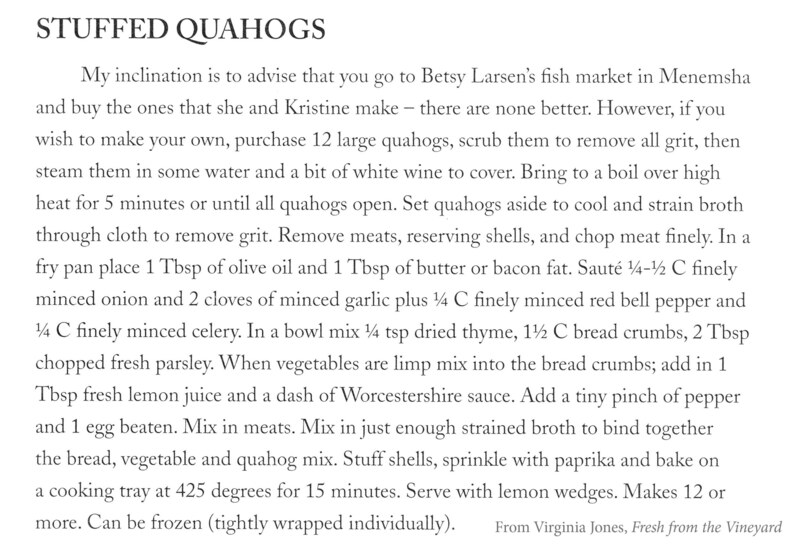 As in this recipe, it's the large chowder quahogs that are usually stuffed, both for their large size (more, but tougher, meat) and lower price. But for those who enjoy the occasional recreational hand-clamming (or raking), this is a fun recipe that will also work for the cherrystone size clams you'll pull up while looking for littlenecks and scallops. Sure, it's more work to stuff cherrystones, but, as Ginny Jones points out, if it was about the work you can just buy them already stuffed at Larsen's -- those are plenty good. 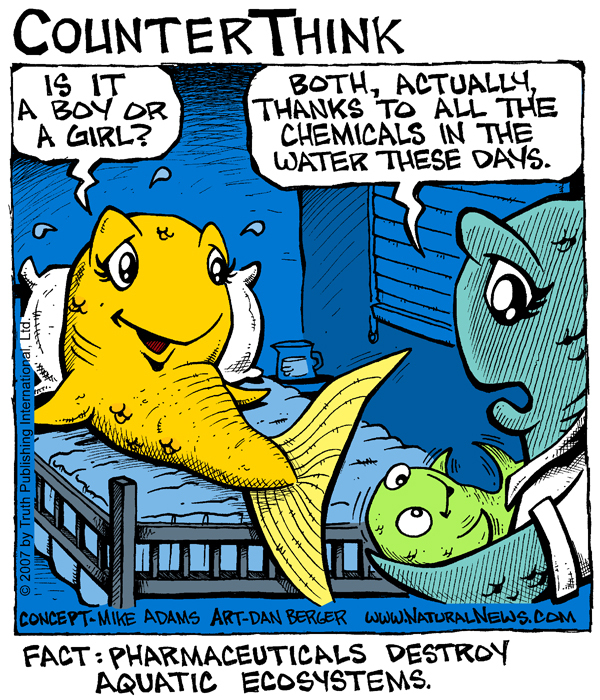 After flushing or dumping down the drain, many drugs retain their biological activity once they reach the water supply. Photo by Carly Lesser and Art Drauglis. As a follow-up to the successful prescription drug collection effort held by the Dukes County Sheriff’s office, the Edgartown Police Dept. have now implemented a collection box of their own. Providing a safe disposal option for prescription drugs not only helps keep them from misuse, but also lessens the chance that these pharmaceuticals will cause adverse environmental impacts. The absolute worst, but unfortunately common, disposal method is to pour or flush these materials down the drain. Many pharmaceuticals, even over-the-counter ones, can cause negative impacts on septic systems and harm aquatic vegetation and wildlife. Even after processing at wastewater treatment facilities, the potential for harm remains. The other option available to us until now has been to put them in the trash; however, unless pills are crushed and liquids mixed with sawdust or kitty litter, the possibility of them being reused still exists. For some of these materials, incineration still does not guarantee complete destruction. 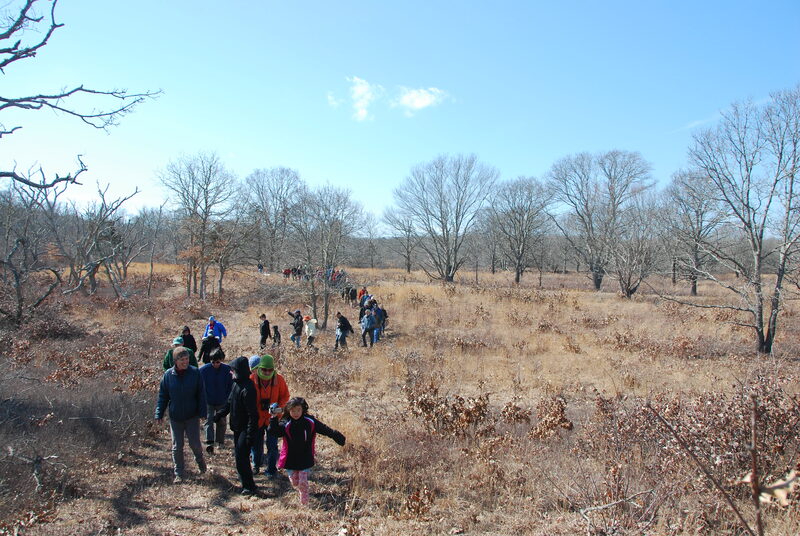 A far better alternative is now available in the program established by the Edgartown P.D. Satellite imagery from NASA depicts the extent of winter sea ice. The thick ice formed over many years is shown in the central bright white; the lighter white areas indicate thinner ice. As reported by the BBC, a new study carried out by a joint US/China team links rapidly melting Arctic ice to the dramatically more severe winter weather over recent years across North America, Europe, and China. It says that the Arctic has undergone rapid melting over recent decades, caused by global temperature rise -- ice cover of Arctic waters has declined by roughly two million square kilometers between 1979 and 2012. The trend line is steadily downward, and this winter also appears to be tracking the trend. Long range weather trends have multiple causes, such as El Niño/La Niña cycles and natural changes in the sun's energy output, but one of the study's authors says "We don't see a predictive relationship with any of the other factors that have been proposed, such as El Niño; but for sea ice, we do seea predictive relationship." In a nutshell, the climate impacts are the result of weakening of the jet stream due to reduced Arctic sea ice. When more of the ocean is free of ice in the autumn, it releases more heat than usual. This warms the atmosphere, reducing the air temperature difference between the Arctic and the northern latitudes. This in turn reduces the strength of the jet stream, which ordinarily moderates Europe's weather. The southward flow of cold air from the Arctic, enabled by the weakening of these normal "blocking" conditions, can combine with increased humidity in the atmosphere (resulting from extra evaporation from the exposed Arctic waters), and all of the ingredients are in place for more severe winter weather. At this point, you may be thinking “Oh really? So how come we've had a non-winter on MV? ?” Well, the jet stream over the US for much of this winter has dipped far to the south, letting the Arctic air bring terribly bad storms and snow to most of the country – but the jet stream swerved back to the north just before reaching the east coast, and in fact had the beneficial effect for us of carrying warm air from Texas and other southern states straight eastward, collecting more of it from Florida, and bringing it nearly straight north up the coast to us. That's my guess. The original study was published in the Proceedings of the National Academy of Sciences; see abstract here, subscription req’d for full articles.